As the A to Z blogging challenge enters its final week, I've realized that I'm going to need to double-dip once or twice in order to hit on all of the items I want to cover. Today is one of those days, with a classic Two-for-...Monday. It probably won't surprise many people who happen upon this blog to hear that this is a nod to the OSR watering hole known as Tenkar's Tavern. 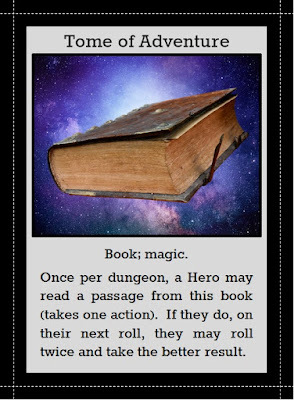 As I've noted, my intention with "tribute cards" this month was to focus on some other bloggers taking part in the A to Z challenge, but I had a hard time not giving some sort of tip of the hat to the locale that serves as the hub of the online gaming community for a lot of OSR types. And once I pieced that picture together from a couple of public domain images...well, I kinda liked it, so we got the Bouncer! If you're one of the few people who somehow finds themselves reading my blog without knowing anything about the Tavern, you should go check it out! It's a very friendly place (as long as you don't screw people over on a Kickstarter). 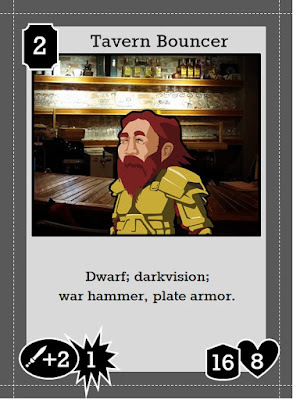 Oh, so why is this tavern bouncer wandering a dungeon and fighting the Heroes that come through? Eh, not sure...but it's probably better not to worry about that until his war hammer is no longer a threat. While almost certainly a more subtle shout-out than some I've managed this month, I hope that won't make you any less inclined to check out the good stuff that Stuart and the team have to offer over at Lloyd of Gamebooks, a great blog covering anything and everything having to do with participatory fiction and related endeavors. It's pretty awesome to see how much passion people have for that art form! Thanks for reading, and please come back tomorrow as I try to give The Good Doctor's Crypt a worthy denizen...!